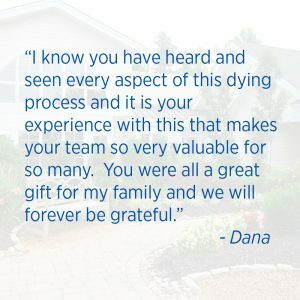 We understand that the end-of-life process is a difficult one. At the Community Hospice House, our compassionate staff treats patients and their families with dignity and respect, ensuring that all needs are met – physically, emotionally and spiritually – in a facility designed to feel like your own home. Each beautifully decorated private room has its own bath, as well as access to the garden area. The Community Hospice House is about people – patients and families — and doing all we can to provide them with comfort, strength and support when it is needed most.